Explore Copenhagen on foot, get fit AND discover the many highlights of the Danish capital. I’m sharing something different today – a European city break. The city is Copenhagen, and although this blog is a Wee White Dug free zone, I hope you’ll still join me for another virtual tour. Keen to discover a new destination, we decided to visit the Danish capital. I trawled hotels on Booking.com before choosing Hotel Skt Annæ, a four star boutique hotel. I booked a small double room on a bed and breakfast basis, and at £660 for three-nights it was a bargain by Copenhagen standards. Hotel Skt Annæ was the perfect base for exploring Copenhagen, and the location was fantastic. Our room was bijou, as expected – no big deal. It was also comfortable, modern, clean and had air-con. The public areas were gorgeous with ambient lighting, comfy corners to relax in, and a stunning atrium which our room overlooked. The hotel also had a popular bar (Form Bar) and restaurant (Format), plus roof terrace. Breakfast was good. The Scandinavian style buffet had plenty of hot and cold options. I love bread, Continental meats and cheeses for breakfast. Mr G loves smoked salmon and scrambled eggs. They had both so we were happy campers. The 7am weekday and 7:30am weekend, breakfast start suited us early birds. By the time Copenhagen sprung to life, we’d already racked up an impressive step count from pounding the pavements. We were delighted to find Copenhagen’s most iconic and colourful street a mere 0.1 mile away from our hotel. Nyhavn is a historic canal, lined with bustling, waterfront bars and restaurants. The author Hans Christian Andersen lived in cheery Nyhavn for over 20 years, so it’s hard to imagine what inspired him to write such sad stories. Nyhavn comes to life around midday, and the waterside bars and eateries remain busy well into the night. The sound of street musicians mingles with the happy chatter of winers and diners, as sightseeing barges cruise up and down the canal. We fell in love with Nyhavn and spent lots of time there eating, drinking and taking far too many photos. Watching what we thought was a bridge, rise to let a ship with masts pass along the canal, as a queue of vehicles waited to cross. Eating Nutella churros from Gelato Rajissimo after a full-on day of sightseeing, and a step count close to 40k. Enjoying a drink (or two), and watching the world go by from the courtyard of McJoy’s Choice Scottish Bar. You can take the Scottish travel blogger out of Scotland ………. We’re suckers for a sunset and Copenhagen put on a show for us on our first night in town. It started with a subtle, pink hue in the sky. Then golden hour arrived, making Nyhavn’s window panes glow. En route back to our hotel we stopped to admire a tall ship, silhouetted against a sky that was changing from pink to orange. By the time we arrived at our hotel the sky was orange. “THE ROOF” I screamed and Mr G looked at me as if I’d lost the plot. “Our hotel has a roof terrace.” I explained. We charged inside like lunatics, heading straight for the roof. All too aware that sunsets are often fleeting, we were almost afraid to look when we stepped outside. On one side there was a pretty view of rooftops. Wowzer, the sky was on fire. The Little Mermaid statue is one of Copenhagen’s most popular tourist attractions. It was just over a mile away from our hotel. Our waterfront walk to visit Hans Christian Andersen’s storybook mermaid took us by grand fountains, a building with blue eyes, and a statue who appeared to have swapped cities. Unlike Disney’s Ariel, Denmark’s Little Mermaid didn’t win the heart of her prince. She died and turned to foam on the sea, but her kind heart gained her a place in human heaven where she lived for eternity. Now pass me the tissues, I have something in my eye. The Rundetaarn or Round Tower is a historic observatory in the heart of the city. Commissioned by Christian IV, it was completed in 1642. On the day of our visit they cast open the doors at 10am, to find a couple of impatient Scots waiting at the front of queue. We purchased our tickets (approx £3 per adult) and began to spiral up the tower at a near sprint, snapping as we went. We both have a competitive streak, so there was no way we were going to be beaten to the top. Rundetaarn has a rich history. In 1807 it was bombarded by the British as the townsfolk sheltered inside. When Tsar Peter the Great visited in 1716 he rode up the tower on horseback, followed by his wife in a horse-drawn carriage. Since then it’s been driven up, and cycled up on unicycle, penny-farthing and racing bike. Claiming the summit for Scotland, our tower sprinting efforts were rewarded with a fine view. spiralling back down the tower at a more leisurely pace we stopped to view the Bell Loft which houses the bells of the adjoining Church of the Trinity. Among the artefacts in the loft, was a rocking chair bathed in light. It looked like a scene from a horror movie. Down another level we stopped at what was once the city’s university library, but is now a gallery and concert venue. We loved the ‘Comic Citrone – festival of contemporary art & letters’ exhibition that was on during our visit. It was fun, and did make you stop to think about how much technology and the internet dominates modern life. The thought didn’t stop us grabbing a coffee and checking our social media feeds though. Before leaving I left a Wee White Dug doodle on a graffiti wall in the gallery. Authorised vandalism is fun. Mr G left a juvenile comment not worth repeating, and so ended an enjoyable visit to the Round Tower. In 1971 Freetown Christiania was founded when a group of hippies began squatting in an abandoned military barracks on the fringes of town. Today they own the land (all very official and capitalist). The society consists of around 1,000 inhabitants who live independently from the Danish state. It has its own governance structure and rules. Christina is car-free and green. Many of the houses are self-built. It’s an odd, colourful place, with a slightly edgy vibe. Running and photography are not permitted as marijuana dealers operate illegally in the main street known as ‘Pusher Street’ (we gave Pusher Street a wide-berth). I found Christiana both fascinating and frustrating. I’d love to have taken photos. Some of the self-built houses were incredible, but for me the place had a grubby, seedy and dilapidated feel. I’m obviously not cut out for a hippy/anarchist lifestyle. Walt Disney was so impressed by Tivoli Gardens that he modelled his own theme parks on the historic Copenhagen park. Inside it’s uncannily similar to Disneyland. There’s a storybook ride like It’s a Small World, a runaway train like Big Thunder Mountain and a pirate ship sitting in a lake. We visited after 7pm on Friday evening (live music night) when the ticket prices are higher at around £20 per adult. Tickets only permit entry to the park, and you have to purchase ride vouchers or wristbands separately. We found it overpriced, as the number of rides are pretty limited and are vastly outnumbered by food outlets. Saying that, Tivoli Gardens are still worth visiting. We screamed on a rickety roller-coaster, birled furiously on a waltzer ride and partook in a spot of galoppen (a horse racing game were you roll a ball into numbered holes to move your horse – Mr G won and gloated). We couldn’t resist a trip to Visit Carlsberg to find out if their beer tours lived up to their “if Carlsberg did” advert hype. If Carlsberg did beer tours you’d probably enter the brewery complex via wacky elephant gates – tick. These beautiful beasts date to the early 20th-century and the swastikas are symbols of peace not hate. We stopped to snap a cute vintage vehicle in the brewery courtyard, before heading to the ticket office. Our self-guided tour tickets cost £12 each and included a beer or soft drink. If Carlsberg did beer tours they’d probably allow you to marvel at the World’s largest bottled beer collection. We saw 17,000 of the collection’s 22,588 unopened bottles. Not all beer at Carlsberg went untouched though. Carlsberg’s founder J.C. Jacobsen looked after his workers and generous daily beer rations were provided along with social care. If Carlsberg did beer tours they’d surely include a leafy sculpture garden, where non beer lovers could escape from beer? And horses too – if Carlsberg did beer tours they’d definitely have horses. Visiting the Carlsberg horses was the highlight of the tour for me. Free horse-drawn carriage rides are also included in the ticket price. We ended our tour with a beer in the courtyard bar. My last brush with beer was in the 1980s. A sneaky underage drinking binge (involving Carlsberg) resulted in the mother of all hangovers, and me being grounded for a month. I’ve not touched beer since, but I couldn’t visit Carlsberg without sampling their wares. I took a tentative sip …… it was good. So, did Carlsberg live up to their own hype? Absolutely – it was an excellent tour and good value for money. Aamanns Etablissement is the place to go if you want to try Denmark’s traditional open sandwich or smørrebrød. Served on dark rye-bread and topped with meat, fish or cheese smørrebrød was historically eaten by the working class. Until quite recently Danes has fallen out of love with their native sandwich. Then Aamanns came along and reinvented smørrebrød, transforming it into a mouth-watering work of art. We booked in advance to guarantee a table at the popular eatery. We decided to immerse ourselves in the experience and ordered an apple, lemon and horseradish schnapps to accompany our smørrebrød (with a back-up glass of champagne for me and beer for Mr G) just in case it was vile. It burned like fire on the way down, but mellowed with perseverance. The flavour was unique, but not unpleasant. The smørrebrød on the other hand was an immediate hit. It looked far too pretty to eat, and tasted as delicious as it looked. We had the recommended two pieces each. Mr G started with marinated herring, citrus, mustard, buckwheat and fresh cheese. He loved it. I went all exotic and had small potatoes, smoked mayonnaise, pickled onions and ash! It was beyond delicious. Next up Mr G had pan-fried plaice, citrus mayonnaise, shrimps and pickled onion. It’s the best thing he’s ever eaten. I know this to be the case as he’s told me at least 1,000 times since our visit to Aamanns. My second portion of free-range chicken, honey and mustard, celeriac and crispy chicken skin sunk me without a trace, but it was lovely. I admitted defeat after eating a third of it. We both still managed to devour a dessert of lemon mouse, verbena sorbet, cream and cookie. It was amazing, the sharp taste of lemon, sweet, crunchy cookie and icy sorbet were a really pleasing mix of textures and flavours. Everything about our visit to Aamanns was perfect – the food, lovely staff, relaxed ambiance and stylish decor. Danish pastries are a must when you visit Copenhagen. We got ours from Lagkagehuset and sat in to enjoy them with coffee. They were divine, and I left a convert to a sweet treat I’ve never particularly liked. I can see why Visit Copenhagen recommend Lagkagehuset in their top ten bakeries list. To rest our tired feet we took an hour out to discover Copenhagen by boat. Boarding at Nyvan, we enjoyed a 60 minute boat tour with Netto-Bådene for a bargain £6 each. It was a great way to learn about the city’s history and we spotted the Royal Yacht too. Heading out to dinner on our last night, I spotted soldiers on horseback in a side street near our hotel. I dragged a hangry Mr G along for a look. We headed into a beautiful square as guards wearing bearskin hats marched past and lined up like toy soldiers. In the square the soldiers on horseback had formed a semi-circle facing a grand building. Out came a carriage, flanked by bodyguards. It turns out the future king and queen of Denmark no less. We were oblivious that we’d been staying on the doorstep of the royal palace Amalienborg. To escape from the hustle and bustle, we spent time wandering in some of Copenhagen’s public gardens. The Rosenborg Castle Gardens were our favourite. Inside we met Hans Christian Andersen – the man who traumatised me as a child with his tear-jerker ‘The Little Match Girl’. Rosenborg Castle, another of the city’s royal palaces is a very worthy photo stop in the garden. We also sought tranquility in Copenhagen’s Botanical Garden – a lovely green space which is free to visit. It’s the perfect place for some quiet contemplation. The Royal Library Garden was another Copenhagen green space we fell in love with. Surrounded by historic buildings, it was less leafy than the other gardens we visited but the architecture was beautiful, and the garden a peaceful haven. The Danes don’t take themselves too serious, so Copenhagen is a great place to let your inner child loose. I did just that by sitting on a chair in a fountain to cool my feet. Mr G refused to participate. He did let his hair down when we discovered trampolines on a street. We need them in Scotland! No one batted an eyelid as we bounced ourselves silly. And that’s how we ended our trip to Copenhagen – bouncing! As luck would have it there was a branch of Aamanns at the airport, so we toasted our wonderful trip with bubbles and good food. I hope you’ve enjoyed this whistle-stop tour of Copenhagen sans The Wee White Dug? 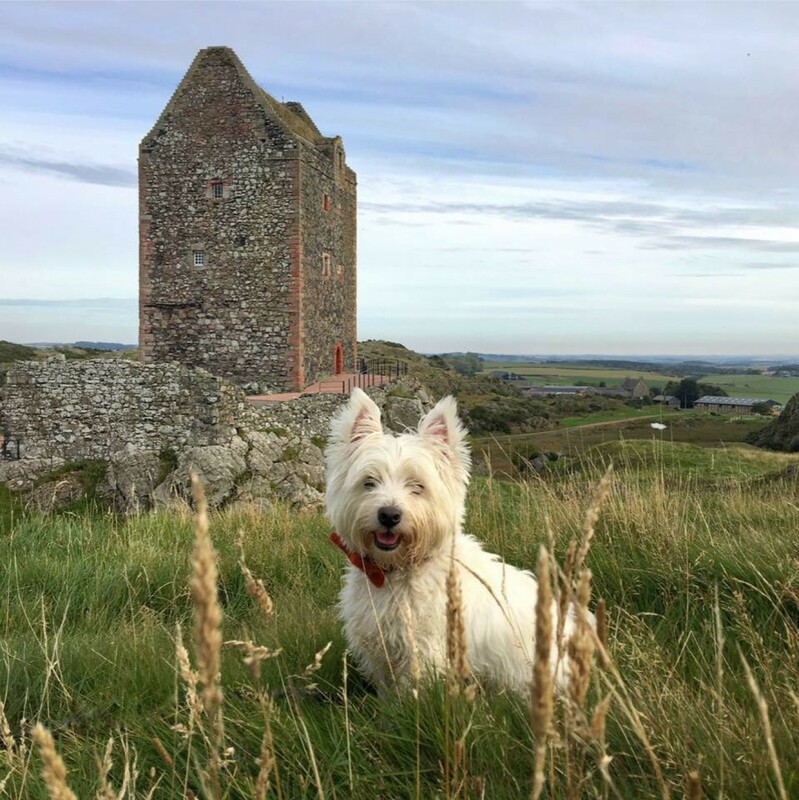 The day after we arrived home to a tumultuous welcome, The Wee White Dug was back on the road for a day trip to Fife. It involved ice cream, white pudding and a run on the beach ‘Chariots of Fire’ style. And here he is posing on Swilken Bridge at the 18th hole of St Andrews Old Course. Think I need to get a guru to look at this computer. Got as far as Carlsberg Beer but the photographs I did see looked amazing. I see that you did a post on Inchcolm Abbey, which is one we did not visit before leaving Scotland. Would appreciate a link to that post if possible. Glad the boy had a day at the beach as compensation. Posted before – got lost I fear – try again. That’s a shame about your PC, you missed the gorgeous food. Inchcolm Abbey is beautiful and the island is fascinating. Here’s the post. Ahhhh Copenhagen sounds amazing on so many levels – pretty sunsets, good food and trampolines in the street! Wowzers. Lovely post and it looks like you had cracking weather too. That is a right result. Thanks Mel, it was such a lovely, sunny trip. Lots of walking and no fixed plans so free to potter and do what took our fancy. We need those trampolines here. Such fun. You visited a lot of things during your time there. We went to Copenhagen one year ago and we absolutely loved this city. We covered loads of ground, but we’re always on our feet so see loads on our walks. It’s a lovely city. I spent a few childhood holidays in Denmark and love the country. Unfortunately my memories, including those of Copenhagen, are patchy at best. I long to see the city as an adult and explore it again. Thanks for virtually taking me there. Looks like a great trip. It was a wonderful trip and a beautiful city. I hope you make it back there in the not too distant future to relive your childhood holidays. I thoroughly enjoyed the blog and your photos. I’d love to read more of your impressions of America if you make it back here. Loved the blog; thank you! Next to Scotland any Scandinavian country is a winner with me. I have to say that I was very pleased to see The Wee White Dog making an appearance at the end. I hope you brought him a present back!! Thanks for sharing your three day break. It looks amazing and is on the bucket list.